World’s best (egg free!) cookies. Having a kid with food allergies doesn’t mean they have to forego the great childhood staple of licking the spoon. One of my kids has multiple allergies, one of which is egg. So I found this recipe – I wish I could credit the original source, but the recipe has been copied by hand into our tried and trusted family cookbook (which currently only has two recipes in, the other for an AMAZING vegan chocolate cake!). These cookies are superb because you can modify them without breaking them. They don’t require any special techniques and your children can probably make them entirely on their own – or with minimal help from an adult or older child. 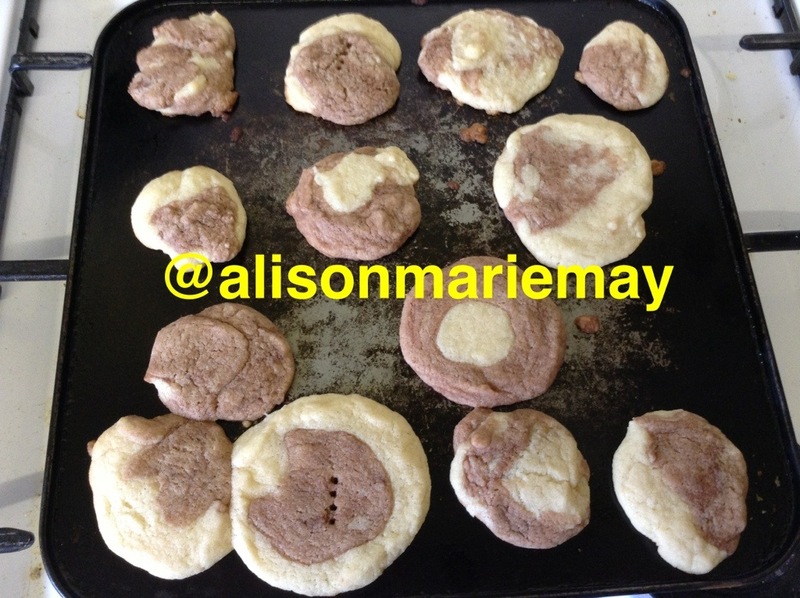 The original recipe is to make basic egg free/vegan sugar cookies. We added cocoa powder and decorated the top with chocolate chips. 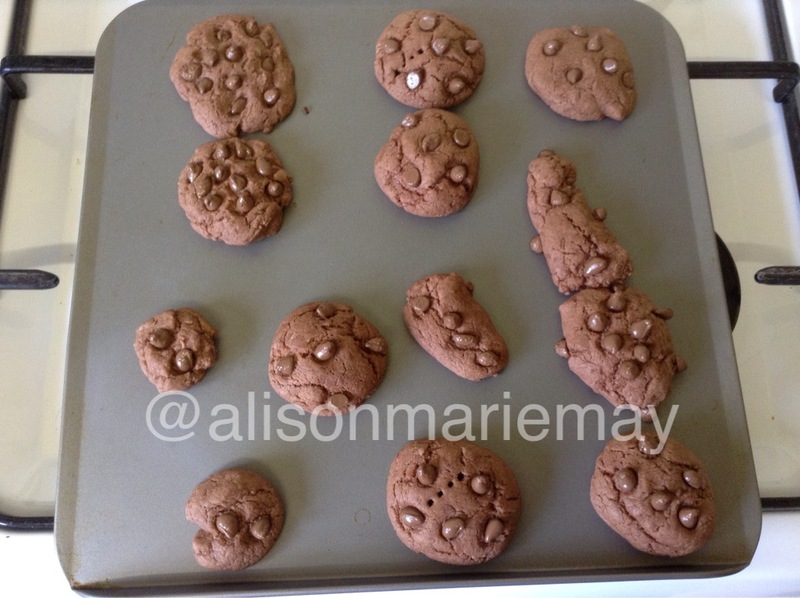 We’ve found Malteser and/or chocolate button tops on the white cookies work well, too. We have only done the whole dip the top in sugar for traditional sugar cookies a couple of times, and they were also nice. But we prefer no sugar on top, chocolate chips mixed in. See? YOU CANNOT MAKE A WRONG DECISION. These cookies are magic whatever you do. Cocoa powder if you love chocolate (we just dump it in until it looks brown enough!). And chocolate chips. You get the picture. 2. 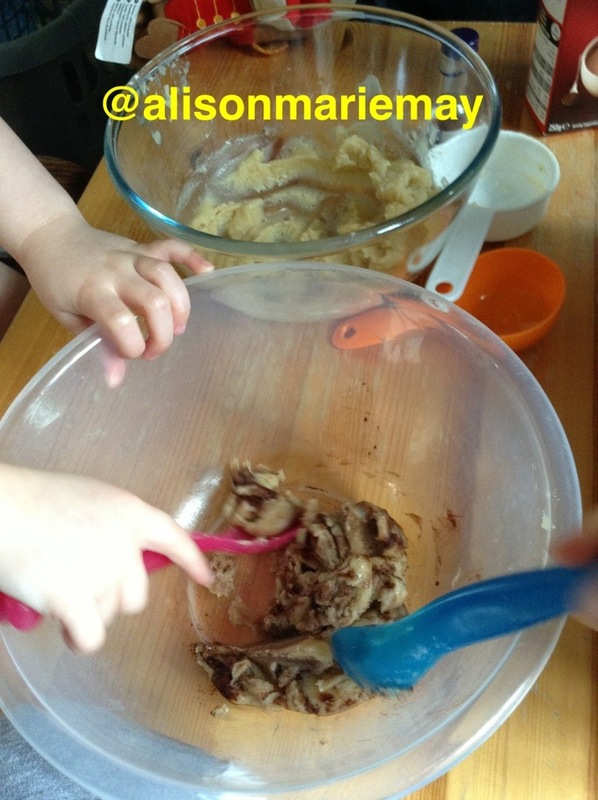 Put dry ingredients in a bowl – salt, flour, and the baking powder if needed. This is also the point you’d add the cocoa powder. 3. We scoop butter into measuring cup, scrape into new wet ingredients bowl, and zap it in the microwave for about 40 seconds. Then add sugar to the melted butter, mix till lighter and fluffier. Or, you know, till it is mixed. Remember, you can’t screw it up. 4. Add vanilla and milk to wet ingredients bowl. 5. Combine bowls into one super bowl of tastiness. 6. Add extra flour if needed. You probably won’t need to, but whatevs. They taste fine after my two four year olds make them, so you’re safe. 7.Break off smaller bits of dough and roll into balls, or snakes, or whatever you want. This usually makes about 12 dough balls/cookies. It making traditional sugar cookies, dip the tops in sugar. 8. Bake 8-10 minutes until lightly golden (if you’ve not added cocoa powder.) I find 8 minutes is enough. Now, apologies to those of you who are not down with the sugar. I’m sure there are equally awesome cookie recipes out there. For those of you in the UK, these truly are more cookies than biscuits – they shouldn’t be hard or crunchy, but firm and soft. That being said, I’ve accidentally both burned and undercooked them. And guess what? If you try these and modify the recipe in a way you think others need to know about, please do leave a comment! My cooking is laughable, but I feel pretty safe trying variations of these delicious little nuggets of awesome. Now, go forth and delight your tastebuds!